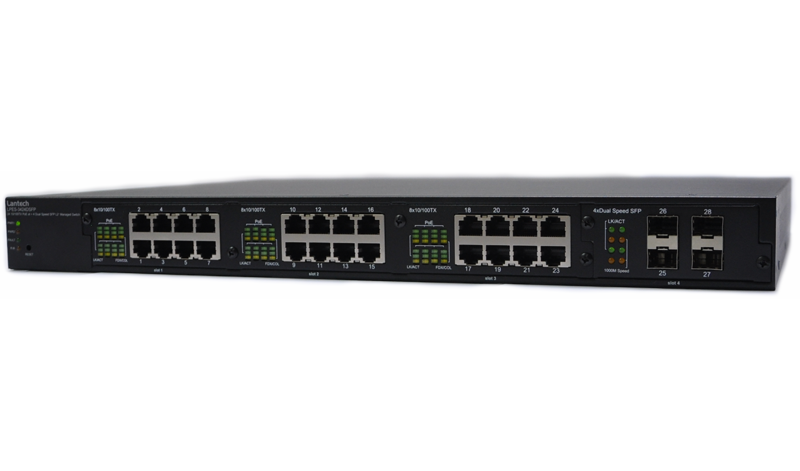 Lantech LPES-3424DSFP is a high performance L2 + managed PoE at/af switch which provides L2 wire speed and advanced security function for network aggregation and backbone deployment. It delivers 24 PoE at/af power injectors up to 30W per port, comprehensive QoS, advanced security, LLDP/Cisco Discovery Protocol for the scalability and resiliency. LPES-3424DSFP can recognize the diagnostic SFP and display SFP parameters on WebUI. Compliant with IEEE802.3at/af standard, the Lantech LPES-3424DSFP is able to feed each PoE port up to 30W for the connected PD devices. It also supports advanced PoE management including PoE detection and scheduling. PoE detection can detect if the connected PD is still alive then sending power; PoE scheduling is to allow pre-set power feeding schedule upon routine time table. PoE port status is to display PoE current, voltage, watt and temperature information. It supports MSTP that allows RSTP over Vlan for redundant VLAN links. The LPES-3424DSFP also embedded several features for stronger and reliable network protection in an easy and intuitive way. The LPES-3424DSFP supports DMI interface that can correspond with DDM SFPs (Digital diagnostic monitor) to display the five parameters in Lantech’s UI, including optical output power, input power, temperature, laser bias current and transceiver supply voltage***. The TX power/RX power raw data is automatically converted to dB values for installer, making it easier to calculate the fiber distance. The built-in RTC (realtime clock) can keep track of time. Lantech LPES-3424DSFP builds all the important management features required in large surveillance network such as DHCP server, ACL for security, SSH/SSL, IGMP Router port , Query / Snooping, advanced QoS with 8 queues. It also can export the configuration in editable configuration file making the mass deployment easier. Lantech LPES-3424DSFP designs with a factory reset button where user can reset all settings to factory default. The built-in watch dog design can reboot switch automatically when CPU is found dead. Lantech LPES-3424DSFP has a built in power for 360W that can feed PoE power up to 250W. It is the best PoE switch to connect with IP Camera, Setup box, VoIP phone / router, Wireless Equipments for MTU, Transportation or Surveillance applications. Alternative A mode. Per port provides up to 30W@port capability.